Both needing to win to stave off elimination, Energie Karlovy Vary and Plzeň 1929 both did that at home on Saturday night so that they can continue fighting on Sunday. Now, they need to do it again so they can force fifth and decisive matches on Tuesday in Prague and Litvínov, respectively. game three. Photo: Milan Mikeš, hokejkv.cz. In the first game of the series, Karlovy Vary built up a 2-0 lead and then let it slip away, eventually losing in a shootout. On Saturday night, they almost let it happen again. They got first-period goals from Petr Sailer and Tomáš Klíma before Slavia came back to tie the score. Early in the third, rookie Dmitrij Jaškin gave Slavia the lead and the visitors were less than three minutes from closing out the series when Lukáš Pech scored the tying goal. In overtime, Petr Kumstát worked out of the corner and cut his way to the front of the net, where he fired a backhander that beat goaltender Miroslav Kopřiva to give Energie its first victory of the series. 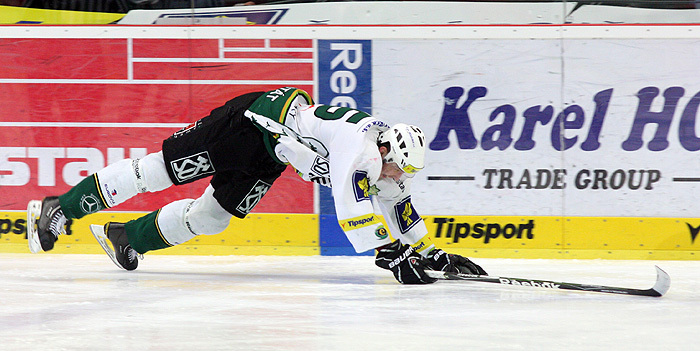 For Kumstát, it was his third goal of the series. Click here to watch game three of Karlovy Vary-Slavia Praha in its entirety. Sunday's game begins at 18:00 Central European Time (UTC +1). To watch live online, check tv.hokej.cz. Martin Volke to put Plzeň up 3-0. Photo: Milan Podpera, hcplzen.cz. After falling behind early in each of the series first two games, Plzeň finally got off to the start they wanted at home, scoring three times in the first period. After not scoring any goals all season, Nick St. Pierre scored in game two Thursday night and was originally credited with the 3-0 goal Saturday night. However, replays show that his point shot was deflected in front of the net by Jan Stránský, and the scoring play was eventually changed. Windsor, CT's Nick Johnson appeared to put Plzeň up 5-0, but it was ruled that he put the puck into the net with a kicking motion. Plzeň was led by 2 goals from Pavel Vostřák, 3 assists from Tomáš Vlasák, and a goal and an assist from Martin Straka. Luboš Horčička made 25 saves for the shutout. Sunday's game can be seen live, starting at 18:10 CET on ČT4 Sport and www.ct24.cz/sport.